Most character actors build their entire career on playing just one or two stock characters and adapting them to whatever movie they happen to be working on. 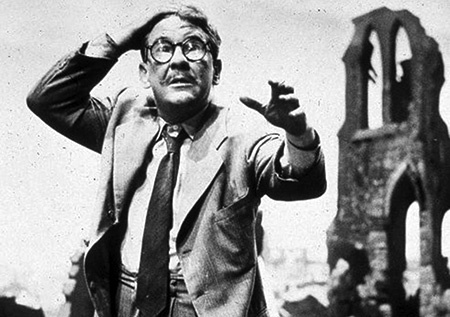 Burgess Meredith was a versatile enough actor to become whatever character was needed. "I was born a character actor. I was never a leading man type" he said of his work. No matter what character he was playing, from the quick-witted George in Of Mice and Men (1939) to correspondent Ernie Pyle in The Story of G.I. Joe (1945) to the delightfully evil supervillain Penguin in the campy 1960s TV hit Batman to the irascible boxing trainer Mickey Goldmill in the Rocky series to the bookish banker left alone "With Time Enough at Last" to read in the classic episode of The Twilight Zone, the audience only had to glimpse that sympathetic face and hear a few words in that distinctively raspy voice to know it was Burgess Meredith before they were as lost in the character as he was. 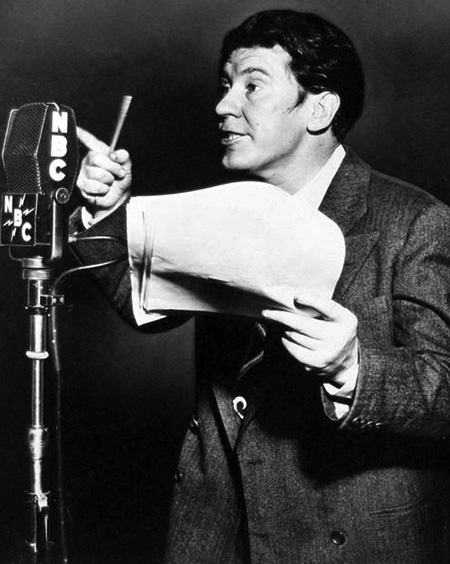 That same voice served him well on the radio, where he was a favored player for Norman Corwin, Arch Oboler, and Orson Welles. 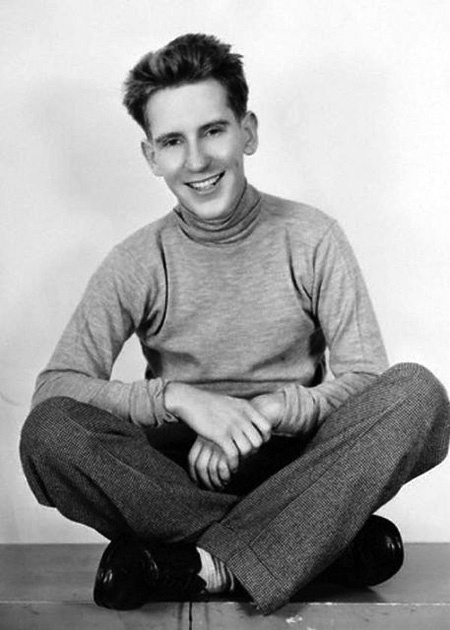 Born Oliver Burgess Meredith in Cleveland, Ohio, 1907, to a Canadian physician and the daughter of a Methodist revivalist. Meredith reported that he had a grim childhood, "If I close my eyes and think back, I see little except violence and fear." He graduated from the Hoosac School in 1926, and attended Amherst College as part of the Class of 1931, but dropped out after failing trigonometry. For a time, he drifted, making a living as a salesman, a clerk, reporter, editor, Wall Street runner, even as a merchant seaman, before discovering acting. He joined Eva Le Gallienne's Civic Repertory Theater troupe in 1929, and made his Broadway debut in 1932 in Alice in Wonderland, playing the Duck, the Dormouse, and Tweedledee. His breakout role was in Winterset, a 1935 play in verse which was based on the famous Sacco-Vanzetti case. He also starred in the movie version in 1936, and the play was selected for the premiere episode of radio's Best Plays in 1952. During the War, he served in the Army Air Corps and achieved the rank of Captain. He was selected to play the part of Ernie Pyle in part because he was relatively unknown at the time (the other choices were Walter Brennan and James Gleason). However, if Capt. Meredith appeared in the film, all the profits would have to be donated to Army Relief, and the Army refused to separate him from active duty. The Army was overruled by Presidential adviser Harry Hopkins, and Meredith's Honorable Discharge was personally signed by General George c. Marshall. The Army also provided 150 soldiers to appear as extras in the film. The troops were veterans of the Italian campaign and were undergoing training for redeployment to the Pacific. Their training continued during the shoot, and the Hollywood actors lived and trained with the troops during filming. In Hollywood, he was known for violent mood swings, which he later revealed were related to cyclothymia, a form of bipolar disorder. 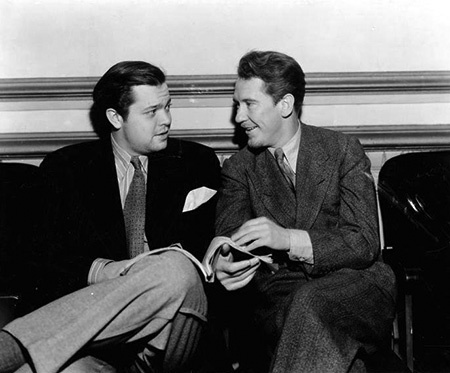 His liberal politics brought Meredith to the attention of the House Un-American Activities Committee, which led to his blacklisting and a seven-year break in his movie career. Otto Preminger was instrumental in helping to restore Meredith's film career, casting him in Advise and Consent (1962), In Harm's Way (1965), Hurry Sundown (1967), Skidoo (1968), and Such Good Friends (1971). 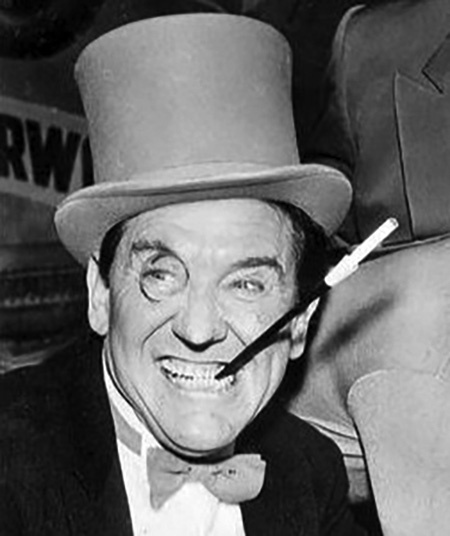 Meredith became the Penguin on ABC TV's Batman in 1966. He took some criticism for engaging in a project that was "beneath" his talents, but after the first episodes were aired "Batman became the in-thing to do." Penguin became one of the series most popular villains, and the writers were instructed to have a "Penguin script' ready to go for whenever Meredith was free from other projects. One of the gimmicks he brought to the role was Penguin's distinctive grunting laugh. It came about because Meredith had given up smoking 20 years prior to beginning the series, but one of the character's props was a cigarette in a long cigarette holder. The smoke would get caught in his throat, and rather than ruining takes by coughing, he used the laugh. He said, "I sounded more like a duck." Penguin tied with the Joker (Cesar Romero) for most appearances on the Batman series. The character of Mickey Goldmill was featured in the first three installments of Sylvester Stallone's Rocky series. Burgess Meredith was nominated for the Best Supporting Actor Oscar for the original Rocky (1976). His character died in Rocky III (1982). The character appears in flashback using archival footage in Rocky V (1990). Burgess Meredith published his autobiography, titled So Far, So Good, in 1994. He died in 1997 at his Malibu home of Alzheimer's Disease and melanoma. He was 89. A Star on the Hollywood Walk of Fame at 6904 Hollywood Blvd honors Burgess Meredith's contributions to Motion Pictures. Be the first to comment on "Burgess Meredith"